What a handful of Republican oil producers and a number of Democratic politicians hope is that the voting public will approve something that the Legislature has spent all year avoiding: raising the “incentive rate” for gross production taxes (GPT) from 2 to 7 percent. A group of vertical-well producers with historic ties to the powerful Oklahoma Independent Petroleum Association, OEPA voted at its October board meeting to support putting GPT on a 2018 ballot, Cantrell said. He added that the initiative petition will seek to change the state constitution and will require about 123,000 voter signatures to reach the ballot. 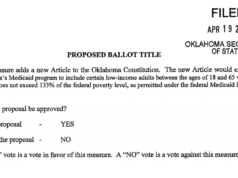 While organizers have not released specific language for their ballot effort, they have incorporated an entity called Restore Oklahoma Now, hired oilman Mickey Thompson to run the campaign and distributed a press release. In it, Thompson bashes the Senate’s now-defunct compromise plan to double the GPT incentive rate from 2 to 4 percent. But although some lawmakers and a chunk of the public have gotten on board the “restore 7 percent” train, Oklahoma is still driven by oil and gas, and the state’s biggest conductors are not interested in changing tracks. Wigley, a native Oklahoman who has returned to guide OIPA through a changing political and petroleum landscape in the Sooner State, said he would prefer not to spend time and resources defeating the OEPA’s ballot initiative. “I contend this really stems from the passage of the long-laterals bill this year,” Wigley said. “The future of oil and gas development is horizontal drilling, and they don’t like that. I think that is a big part of why Mike Cantrell is out there doing this. Wigley’s group, the Oklahoma Oil and Gas Association (OKOGA) and each organization’s powerful member corporations all oppose the 7 percent GPT initiative petition, but OEPA members carry interesting clout of their own, at least concerning personal public profiles. Although OEPA member and former Republican Mayor of Tulsa Dewey Bartlett did not return a phone call for this story, his political surname has been behind GPT increase efforts as vocally as Tulsa Democratic billionaire George Kaiser. Norman’s Ray Potts has supported countless state and local nonprofit efforts through the Potts Family Foundation. Then take a town like Seminole, home to current Republican Rep. Zack Taylor (himself an OEPA board member) and Darlene Wallace, an Oklahoma oil woman who took control of Columbus Oil when her husband, Dan, died in 2004. Wallace is no stranger to Oklahoma’s political machinations herself, with her former husband having lived next to David Boren when he ran for governor in 1974. While a great deal has changed in both politics and petroleum, Wallace said she is still drilling about one well per year. Wallace said her company spent about $350,000 this year to reopen an old well and lost about twice that in an attempt to drill a new well last year. OKOGA’s vice president of communications said its members oppose the announced ballot initiative. “OKOGA is in alignment with OIPA on maintaining the permanent two-tiered GPT rate,” Donelle Harder said. OU political science professor Keith Gaddie believes a vote of the people on 7 percent GPT would be an interesting campaign to observe. “You’ve got two competing strains of Oklahoma politics at work here,” Gaddie said. “On the one hand, there’s the old saying that no matter what you do in Oklahoma, you are in oil and gas. We’ve always said that. Gaddie noted that the easiest tax to pass is a tax on people who cannot fight back. That certainly is not the case with Oklahoma’s oil and gas interests, but he said the division over GPT complicates matters. A longtime oilman and political consultant known to friends by his childhood nickname “Bubba,” Cantrell recognizes that tension as well as anyone. But Cantrell has aggravated Wigley, OIPA members and others this year for pushing a narrative vastly different than he did at a 2014 rally against raising industry taxes. “The state of Oklahoma cannot afford to raise taxes on this industry, because when you raise taxes on this industry, you take money out of the economic engine that’s funding schools, that’s funding road projects, that’s building medical facilities,” Cantrell was quoted as saying then by NewsOK.com. Wigley, who himself has years of experience running and opposing ballot initiatives across the country, said raising GPT will hurt drilling, hurt the industry and hurt Oklahoma’s economy. Wigley said he imagines the OEPA initiative will inevitably be supported by environmental advocates who simply dislike the oil and gas industry. Wallace said she employs fewer people than that and runs much of her business herself. Wallace said that while some women might not know much about GPT, she believes the message of OEPA’s ballot initiative is ultimately about funding the state services that every Oklahoman wants. As a former OIPA boardwoman, Wallace said Wigley’s organization no longer has Oklahoma’s best interests at heart. While the back and forth between OEPA and OIPA may ebb and flow for the 12 months ahead of the 2018 general election, Gaddie emphasized something that will not change.